May is set to be a month of merriment, fizzled with a smidge of mayhem, with the return of Singapore Cocktail Festival 2018! Happening from 4 to 13 May, the illustrious 10-day long gala will see to the likes of revered mixologists, spirit aficionados and passionate imbibers, gathering together in celebration of the complex concoction we call the cocktail. With the inaugural ceremony of this year’s Asia’s 50 Best Bars awards taking place on 3 May, the festival will begin eventfully on the following day, kicking off with the Festival Village that lasts over the weekend of 4 to 6 May at the Empress Lawn. The conviviality then continues at various bars all over Singapore, where highlights include special food pairing menus and intimate bar tours for an ultimate cocktail experience. So how does one revel with discernment at the 10-day long festival? It is only natural to hanker for a taste of a cocktail formulated by an award-winning bar. 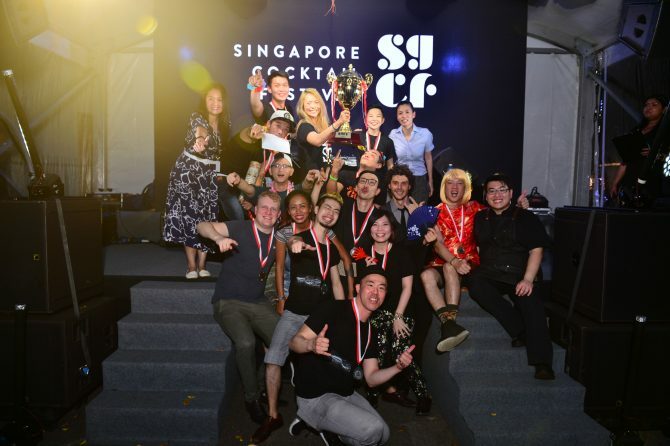 And what better chance to do so than at the upcoming Singapore Cocktail Festival, taking place right after this year’s Asia’s 50 Best Bar awards? By the time Festival Village launches, Asia’s 50 best bars will be on everyone’s lips, figuratively and soon literally once they imbibe on the winning cocktails. And it’s not just the local entrants that you can see for yourself if they’re deserving of their coveted spots. Bars beyond Singapore’s terrains, such as South Korea’s Pussyfoot Saloon, Thailand’s The Bamboo Bar and Kula Lumpur’s Skullduggery, will make an appearance at the Festival Village. And who knows, perhaps some of them will be inducted into the list which means you can try their cocktails without travelling abroad. Singapore Cocktail Festival takes place from 4 to 13 May 2018, with the Festival Village held at the Empress Lawn (in front of Victoria Hall) over the weekend of 4 to 6 May.